BMS2000 is a website originally started by five Quebec genealogical societies, for their private use, to make a database of birth, marriage, and burial (Bapteme, Marriage et Sepulture) records. The site has since been made public and now includes contributions from 24 member societies. BMS2000 is a pay site if you don't belong to a member society and want to see details about the records (though in most cases, not the records themselves), but it is very inexpensive. For me, it was cheap at twice the price. Searching for Maggie Dean as the Child in a baptism in Waterville, Quebec with no year entered gave me the result above. To see more, I would have to pay. For $20 Canadian (current rate is about 80 cents on the US$ I believe), you get 200 vouchers, so basically ten cents per record viewed. I've searched for many records here now and am still on my first $20. "Complete listing at the ANQ in Qc. The index of licenses on sale at the SGQ." So what were the ANQ and SGQ? The more accurate acronym for the ANQ is BAnQ, Bibliotheque et Archives Nationals du Quebec, the National Library and Archives of Quebec. 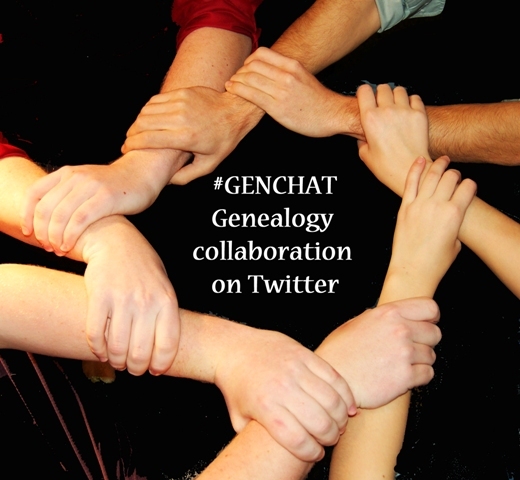 The SGQ is the Societe de genealogie de Quebec, the Quebec Genealogical Society. I chose to explore the former. Keep in mind that this index is being created by volunteers from twenty-four different local historical societies in Quebec. I think that is why there is more detail on one record, less on another. Just something to keep in mind in terms of accuracy. Also, make sure to print or otherwise save your search results. If you want to print, from inside the pop-up with the record details, choose "Retain this record". Then, from the left of your screen you can print individually, by retaining only one record at a time, or from everything you've retained during that session, by waiting to the end. The next time you log on, the records may not be there, so be sure to save your records before logging out. Otherwise you will have to pay again. I may have missed something, but I don't think I saw that spelled out clearly on the site. So, as I said, my next step was to visit the BAnQ website. This website is in french as you would expect and their translate button won't work for everything, but it isn't too difficult to get past that. The third row has two collections, the "Lovell directories of Montreal and its suburbs" and "Quebec registers of civil status, from the beginnings to 1913" - these are the church records - images from the civil copies of the church books. Choosing that option will bring you here"
This screen illustrates why you may still need or want to visit BMS2000 before coming to BAnQ. There is no index for these records here. In order to use this site effectively you need to know the name of the church, or the region or district, or be willing to dig in for a longer search. I've had luck finding regions and districts for towns in my research on Wikipedia. Searching by parish (paroisse) can be tougher unless you know the name of the church. Entering Maggie's information from BMS; Waterville Congregational Church and the year 1872, led me right to her record. And next for the Smiths - would I find records here from St. Andrew's Presbyterian church in Buckingham? My heart was beating out of my chest and I swear I was hardly breathing. I was so grateful to find this record and I'm looking forward to a visit to Montreal and BAnQ (who have suspended digitization efforts for the time being due to budget cuts) to find more records. Next time, another record collection at BAnQ and my conclusions about Norman Parker's short life. Oh, Anna, I followed along with you and it was rewarding to get to the end and see that burial record. Lots of records available for not a very big price--I need to revisit my Canadian line to see what I can fill in from this resource. Thanks. BMS2000 is a great ressource. I use it as an index to find records in FamilySearch, where you can find all the Church registers from Quebec. 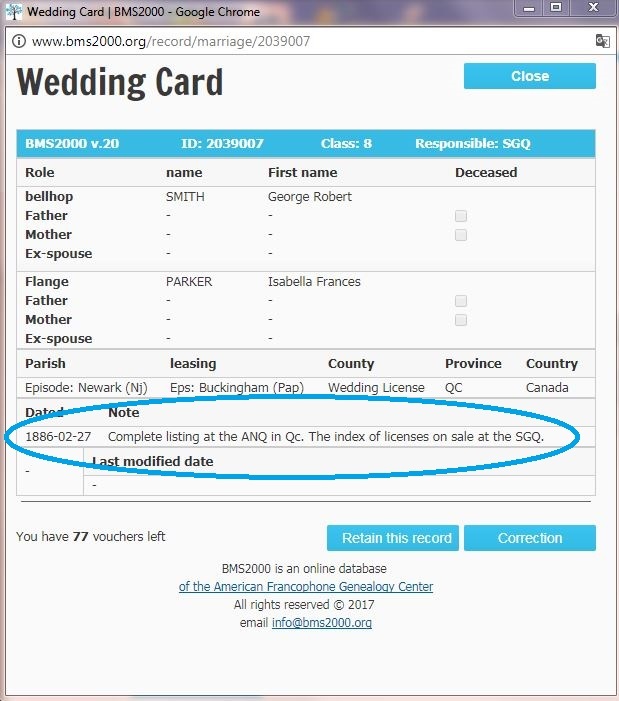 I mostly use the Catholic registers as all my ancestors are RC, but using the info from your screenshot above (Waterville, Congregational), I was able to find the same record. I had a look at the Drouin collection on Ancestry and it's weird. The Waterville records are there, but they are missing 1872. One thing to remember about church records in Quebec, the church would register a birth mariage en Death, and then they had to send a copy of the registers to the courthouse. So unless a copy was destroyed, two copies of all records exists, and they are both available online. Ancestry has the Drouin collection that was microfilmed in the 1940s from the courthouses, and FamilySearch has the church copies, microfilmed by LDS in the 1980s. If you have a lot of family in the Eastern Township region, I recommend to become a member of the Société de Généalogie des Cantons de l'Est. They built a BMS file (fichier Connolly) with a special focus on all the parishes from that region. ANQ stands for Archives Nationales du Québec, before it was merged with the National Library to become BAnQ. Quality of their scans is great, but it's still limited. To go around budget constraints, they recently partnered with Ancestry to move forward with the digitazation of notarial records. The saddest record I've ever been so happy to find.